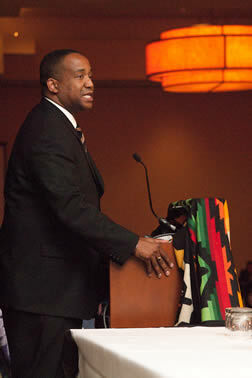 Andre’ Birotte Jr., U.S. Attorney speaking at the 12th National Indian Nations conference. Susan B. 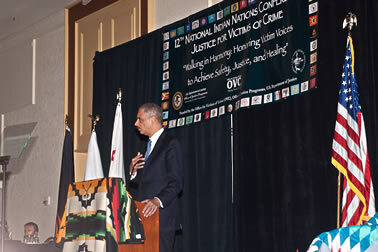 Carbon, Director, Office on Violence Against Women, USDOJ, addresses attendees of the 12th National Indian Nations conference. 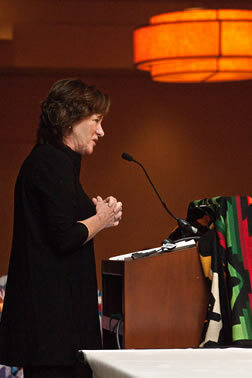 Mary Lou Leary, Deputy Assistant Attorney General, addresses attendees of the 12th National Indian Nations conference on December 9, 2010. 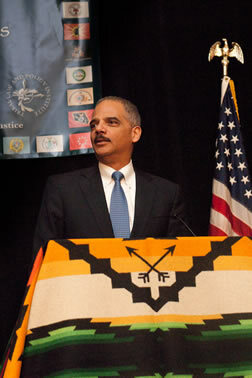 U.S. Attorney General Eric H. Holder, Jr. addresses attendees of the 12th National Indian Nations conference on December 9, 2010. 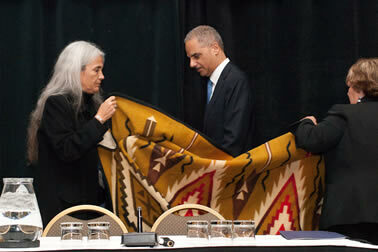 U.S. Attorney Eric Holder, Jr., receiving the honor blanket from Abby Abinanti, Superior Court Commissioner in California and Chief Judge at Yurok, (shown in photo to the left), and LaVonne Peck, Tribal Chair for the La Jolla Band of Luiseno Indians. 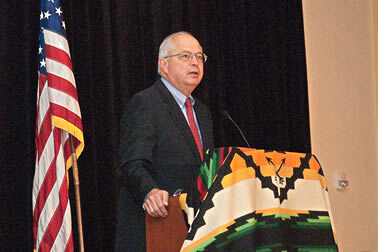 Larry Echo Hawk, Assistant Secretary for Indian Affairs, U.S. Department of the Interior, delivers his keynote address on December 11, 2010, at the conclusion of the 12th National Indian Nations conference. 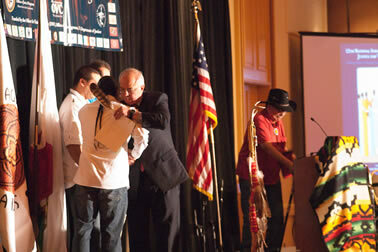 Larry Echo Hawk, Assistant Secretary for Indian Affairs, U.S. Department of the Interior, receiving congratulations from The Boyz after being presented with an eagle feather by Jim Clairmont at the conclusion of his closing keynote address on December 11, 2010, at the 12th National Indian Nations conference. 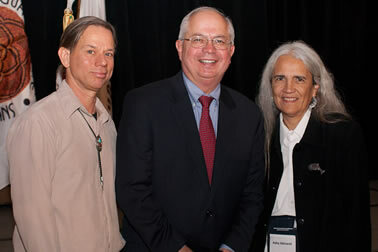 Group photo (appearing from left to right): Jerry Gardner, Executive Director of the Tribal Law and Policy Institute; Larry Echo Hawk, Assistant Secretary for Indian Affairs, U.S. Department of the Interior; and Abby Abinanti, Chief Judge at Yurok. 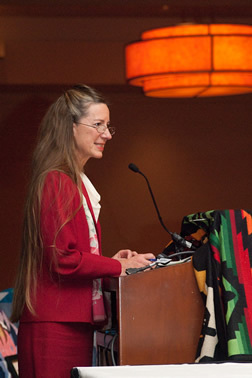 December 9, 2010, Joye E. Frost, OVC Acting Director, welcomes attendees to the 12th National Indian Nations conference. 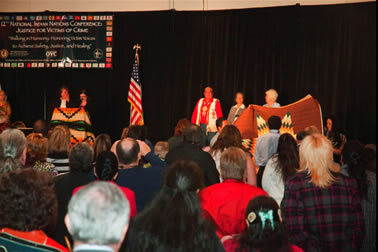 Attendants observe the Cultural Chair Ceremony on December 9, 2010. The Ceremony involved the use of empty chairs to honor crime victims and survivors or those who have lost their lives due to violence. Each chair was draped with a blanket to symbolize a female victim, male victim, child victim and an older victim. 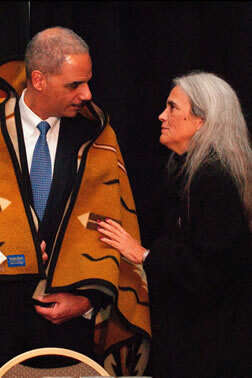 U.S. Attorney Eric Holder, Jr., receiving the honor blanket from Abby Abinanti, Superior Court Commissioner in California and Chief Judge at Yurok, shown in photo, and LaVonne Peck, Tribal Chair for the La Jolla Band of Luiseno Indians. 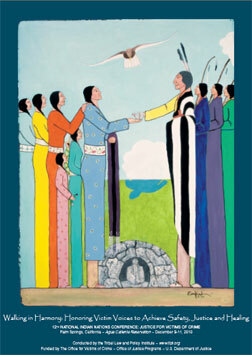 Poster for the 12th National Indian Nations Conference. 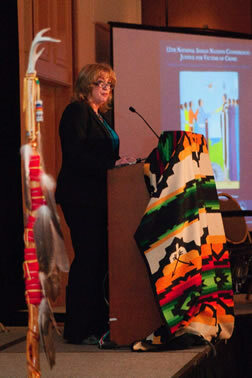 Photos courtesy of Matt Deserly on behalf of Tribal Law & Policy Institute.